Rain moved in about the time we were ready to leave Buddy Gregg RV in Knoxville on Thursday morning, July 23rd. 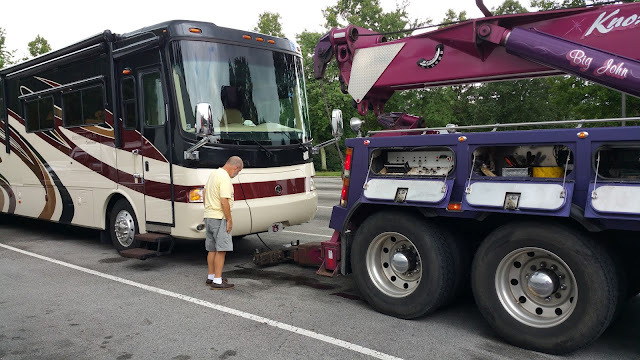 We only had an hour's drive back to Spring Lake RV in Crossville so we didn't hook the truck for towing. Once again, Wayne drove the coach and I followed in the truck. Traffic was heavy and it was raining as we made our way westward on I-40. Then with fewer than 10 miles to our Peavine Road exit, Wayne surprised me by pulling into the TDOT Rest Area at Crab Orchard. I followed him into one of the long spaces for trucks and big rigs. The coach's "Stop Engine" light had illuminated a quarter mile from the rest stop exit ramp. The rain let up, the air temperature was pleasant and we had a safe place to park, but that's about all to be happy about. From our April 2013 experience with the "Stop Engine" light, ( See It Here ) we remembered the seriousness of this warning light. The Cummins manual clearly states not to restart the engine until diagnostics are done and repairs made. There was nothing we could do but call Good Sams Roadside Assistance, report the situation to Cummins and then have lunch while we waited for events to unfold. We were helpless at this point. 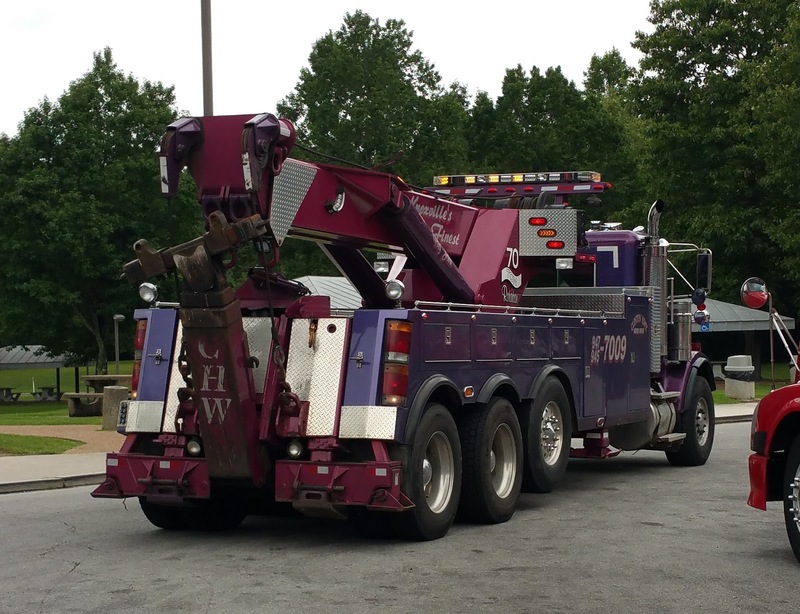 Like the previous "Stop Engine" instance, there would be a flurry of telephone calls between Good Sams and local wrecker operators, then updates to us. Seemed Good Sams had trouble locating a 75,000 pound wrecker. 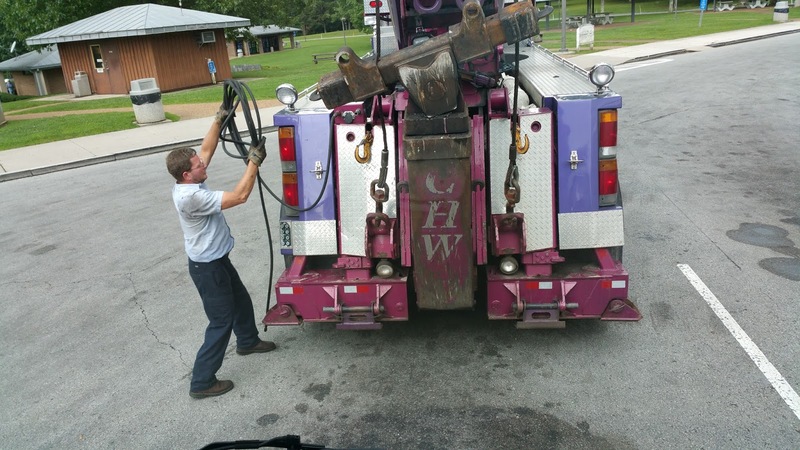 At just a few minutes after 3 p.m., we saw a big violet colored Clinton Highway Wrecker pull in alongside us. Preparing big Endie for tow is quite a project and took about 45 minutes. 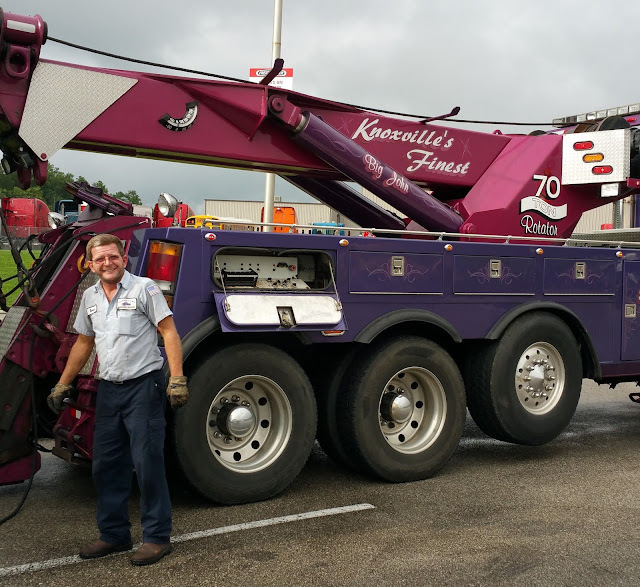 The tow truck operator, Reese, was courteous, friendly, well-spoken, quick stepped and knowledgeable about the job that lay before him. Reese, preparing to force air into Endie's airbags to lift her so he could reach the drive shaft. 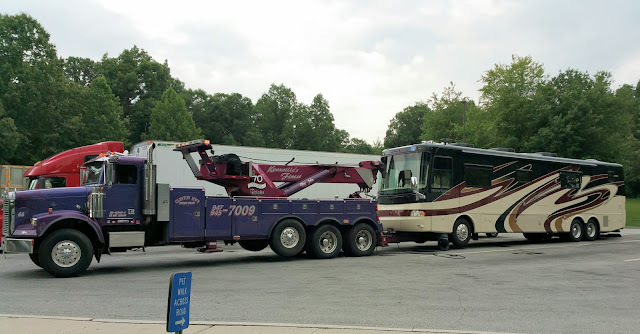 In order to tow the coach, the drive shaft had to be disconnected. In order to get to it, Reese attached an air hose to Endie to lift her from the ground a bit. Once the drive shaft was disconnected, a huge, heavy steel arm was lowered into place and then remotely raised to lift big Endie at her chest. Our newly installed (and heavy) Blue Ox hitch and rock screen had to be removed from Endie's rear so they wouldn't drag. The big ole heavy Holiday Rambler mud flap was taken off too. It was too long (and much to nasty) to go into the bed of our truck so Reese loaded it onto the wrecker. 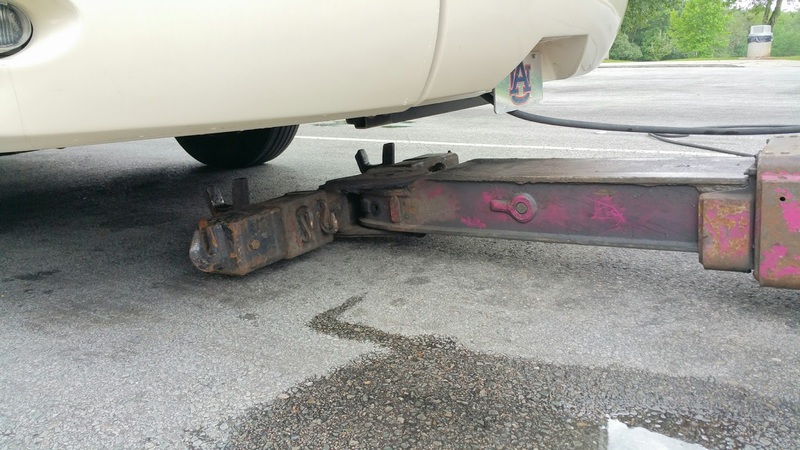 Finally, Endie was ready to tow. Wayne activated the flashers and we held our breath. Visions of the refrigerator and kitchen cabinet contents flashed before my eyes. I wished I had secured everything better. I wondered what would be broken.... I thought about the breakable things in bathroom medicine cabinets, but mostly I just thought about that darn refrigerator. Wayne and I followed behind the tow truck with Endie on it's back. We had to continue another seven miles west on I-40 where we would exit and then double back to the east bound lanes. It would be another 45 miles to Farragut, Tennessee. Good Sams called ahead to Premier Freightliner Truck Group put them on notice that we were on our way. There's a 50 amp site on site where Reese will drop us for the night. We're told it could be as late as Friday afternoon before a technician can do a diagnostic check. Reese is finishing up for the day. Reese dropped us and said his goodbyes. Unhooking took just a matter of minutes and he did not reconnect the driveshaft. That we allowed him to leave without reconnecting it might become a "bone of contention" as the Premier Truck Group people said it should have been done. Inside the coach, hardly anything had shifted in the cabinets. I breathed a sign of relief. Nothing spilled in the refrigerator either. For any reader who may be curious (and for our own future reference) the Clinton Highway Wrecker bill, paid entirely by Good Sams, was $650. Never, ever leave home without it. True to their time estimate of yesterday, Premier Truck Group Freightliner didn't send anyone out to the coach until just after lunch. An hour later another new crankcase breather filter was installed (27 months after the first one). Wayne took instruction with the installation so he can do it himself next time. 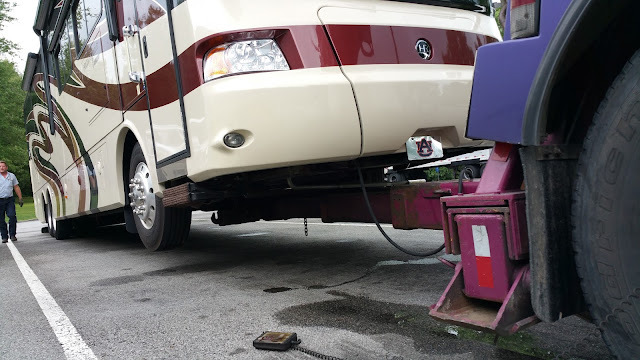 After all, it's done in the cool (or warmth) of inside the coach with nothing more than a wrench, screwdriver and new filter. During his cursory look at the engine compartment, Brandon, Premier's diesel tech, noticed the engine oil in the filter had a milky look. He checked the dipstick and found the milky oil there too. A check of the EGR cooler crossover pipe showed it is leaking coolant into the engine which is seeping past the engine pistons and into the oil. This finding means "the EGR cooler will need to be replaced, the oil changed and then have regen run to recover the aftertreatment system" -- whatever all that means. Replacing the EGR cooler be covered under warranty but will take three full days in the service bay. Appointments for such service at Premier were at two weeks out. With our plan already underway for air conditioner repair early next week and the move to Smyrna for Wayne's bloodwork late next week, we decided to check with the diesel shop in Murfreesboro. . Finally, Brandon reconnected Endie's mud flap while another tech reconnected the driveshaft. Our service at Premier was invoiced at $327 ($250 - 2 hours labor and $77 for the filter). Filters are not covered by the extended warranty. Wayne and I both had concerns that we wrenched the coach frame getting level last evening. Fortunately, the slides came in easily and when we aired her up, Endie was ready to roll again. Whew! Before sunset, we pulled into our campsite at Spring Lake RV Resort in Crossville where we'll wait until we get word from Pal that the air conditioner parts have arrived and are ready to install. Glad it was minor, when my stop engine light came on, my engine needed replacement - fortunately still warranty.